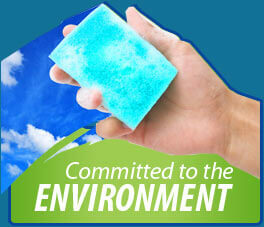 As a full-service janitorial service company in Phoenix, AZ, our customers' satisfaction is our number one priority. Precision Janitorial Services is an individually owned business, not a franchise. 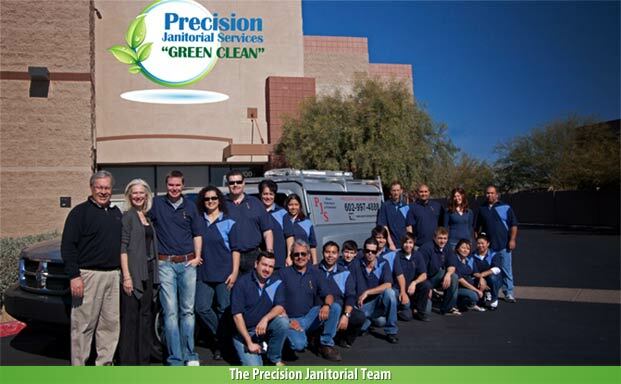 Precision Janitorial Services has been in the Phoenix Valley since 1985. 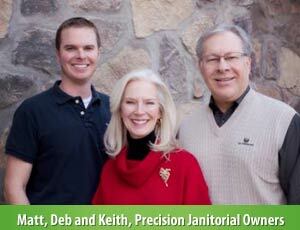 Our owners and management staff have more than 60 years combined experience in the janitorial business. The present management took over the business in 2006 and has lived in the Valley since 1992. He has a financial, marketing and services background. He has over 28 years corporate world experience managing 2,000 employees and $500 million in sales. He has over 40 years' service industry background from small family owned businesses to multi-billion dollar corporations. Keith manages the overall business and the finances. She has a Human Resources and customer service background. She has over 30 years' Human Resources background, specializing in employee benefits administration for major corporations. Deb manages the office. He is a graduate of ASU with a business major. Matt has over 10 years' customer service background. He supervises the employees and staff and manages the daily operations. All employees of Precision Janitorial Services are bonded and insured, and we provide Workers' Compensation. To build a green cleaning business that has a reputation for quality work and honesty.